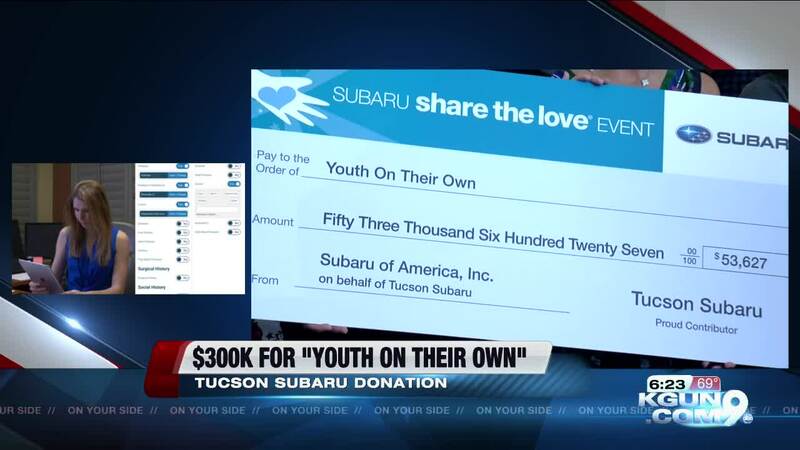 TUCSON, Ariz. — Tucson Subaru presented a generous donation to Youth On Their Own Thursday. As part of Subaru's Share The Love event, the company contributed $53,627 to the local non-profit organization. During its Share The Love event, Subaru of America donates $250 for every new vehicle sold or leased to one of several charities a customer can choose from. "With community contributions and support, Youth on Their Own has helped over 15,000 students stay in school, remain focused on the goal of graduation, and become self-sufficient, productive adults within their community," Subaru said in a press release. This is the fifth year in a row Tucson Subaru has presented Youth On Their Own with a donation check.